On Meta, Babel boxes for languages into which MediaWiki has not been translated (such as gos, pjt, abc...) show the language name as "English". This is because Meta has customized the text of Babel system messages to make Babel box links work correctly on global user pages, leading to T57473: i18n fallback uses message from i18n file before customized message from DB (MediaWiki: namespace). See screenshot for an example (on translatewiki.net). Open None T162415 Make global userpage Babel links point to Meta instead of locally. T162415: Make global userpage Babel links point to Meta instead of locally. bzimport set Reference to bz62714. I don't see how frr and others are incorrect. Could you explain? Change /all/some/ in my above report. Aplologies for my wrong use of English and my typo. T101086: Standardize invalid language codes for Babel extension is related. Why? Shouldn't these be fixed via CLDR? Why is it related? Because they're about related problems. As for fixing them via CLDR, I'm not sure how CLDR could be expected to "fix" all the invalid language codes (e.g., including typos). 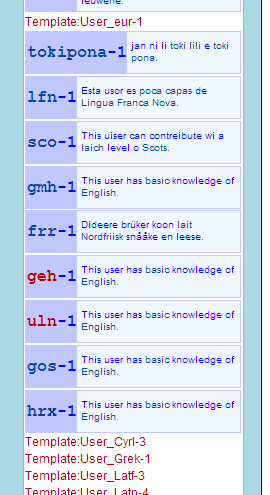 gos-N  This user has a native understanding of Gronings. gos-N  This user has a native understanding of English. This is apparently because the page MediaWiki:Babel-N-n has been customised on the latter two wikis, which confuses the hell out of the Babel extension. If T57473: i18n fallback uses message from i18n file before customized message from DB (MediaWiki: namespace) was fixed, this would be too. TTO added subscribers: KTC, Dereckson, Pathoschild and 3 others. On Meta it is This user has a [[m:$1|native]] understanding of [[m:$2|English]]. Thanks. I deleted that message on twn. Liuxinyu970226 added a subscriber: • MarcoAurelio. TTO removed a subscriber: • wikibugs-l-list. Base created subtask T162415: Make global userpage Babel links point to Meta instead of locally. .
Liuxinyu970226 added subscribers: Iniquity, C933103. @Iniquity: Reading does not maintain Babel hence removing Readers-Web-Backlog. Please only add team projects to task with consent of teams. Thanks.